The new iPhone app (left) has a handy search function, but only the Android app can create wallpapers. iPhone and iPod touch owners have been left out of many features in the Android version of the NASA mobile app for tracking missions and getting news reports, photos and other information about the agency's extensive programs. Highlights of the Apple upgrades that now match the Android version include a new section for news and feature stories such as an update on the Opportunity Mars rover and a section that lists and provides information on missions and programs including the International Space Station and the Cassini Saturn probe. NASA has also streamlined the app's interface. But the Android version still has an exclusive on some neat features, chief among them the ability to easily set any of the amazing images in the app as wallpapers on the Android home screens. Not new, but very fun, features of both apps include fantastic photos and videos, access to NASA's Twitter stream, and a list of upcoming TV programs on NASA projects. 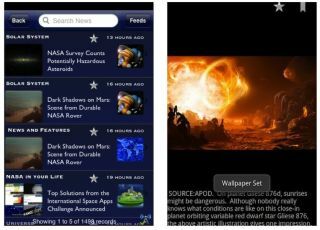 The new NASA app is free and available in the Apple App Store. Follow TechNewsDaily on Twitter @TechNewsDaily.